The Day our NKOTB dreams came true. . .
Nick: "So someone wants us to make a cake that looks like a bottle. . ."
Michelle: "We don't do that"
Nick: "and I told them we don't do that but they wanted me to call you and ask if you will do it as a favor for Donnie Wahlberg"
Michelle: "WHAT? OMG. . you didn't tell them we wouldn't do it did you?!?!?!?!?!?!??!" Now THAT'S a good way to confuse a team member. But how was he to know that we grew up listening to New Kids on the Block and now we are addicted to Blue Bloods? Thus ensued us making a cake that looks like a bottle for Jenny McCarthy's new line of drinks called Blondies. The Sugar Sisters didn't make the bottle cake, btw. Nor would you want us to. Back in our early days before we had talented decorators on staff we once took on an order for a soccer ball cake and it was not a good scene. Like the worst thing ever. We still feel bad about that soccer ball cake. We promised ourselves after that we would never do that again. It's really hard to turn people down but it's also really important to do what you are good at. Shaped cakes aren't our thing. . .now a Black + White cake with the prettiest drip ever. . .yes, totally our thing. Just not soccer balls. Hmmmm. . .wouldn't Jenny like a cake made with her Blondies Strawberry Lemonade instead of a bottle? Maybe a pretty strawberry drip? Ok. . .a bottle it is. Lucky we have our pastry chef Victoria on board who can magically craft a bottle cake for us. The cake itself was made from Sugar Sister Nina's spectacular yellow cake---Jenny's favorite flavor. It was meant as a surprise from Donnie to Jenny on her birthday celebration at the Arcada Theatre Speakeasy in St. Charles. We scheduled to deliver in the afternoon for the party later that night. Now when we deliver a special events cake typically it is at a time long before the party starts and nobody is around. We carefully carry the cake in, place it and leave. Sugar Sisters Michelle and Rissa were on the delivery team (as usual) and were running a little behind on their deliveries that day due to the rain and traffic. They marched into the Arcada looking like they always look at the end of their delivery day (slightly bedraggled and limp), and walked up three flights of stairs to the Speakeasy trying to find a person to advise them on the placement of the cake. Sugar Sister Michelle, out of shape from too many cookies and way too much buttercream over the years, huffing and slightly puffing, marched into what initially appeared to be a vacant room and found a person to speak with about where to place the cake. Somewhere out of the corner of her eye she spied people in a corner of the room. Music was playing. There was a furry dog! Then, the person started to approach and she suddenly realized. . .my goodness. . . Yes, it was Donnie himself. Then that moment arrived and suddenly out of Sugar Sister Rissa's mouth the dreaded. . . .I carried the cake. . . .
That's what happens when you're star struck. It was like Baby meeting Johnny in Dirty Dancing. That moment when the object of your high school fantasy is suddenly right in front of you and you realize that even though you are roughly the same age. . .he just looks so much better. Then you can't speak and you say stupid things like "I carried a watermelon". Can we just have one more chance to say something spectacular and memorable? 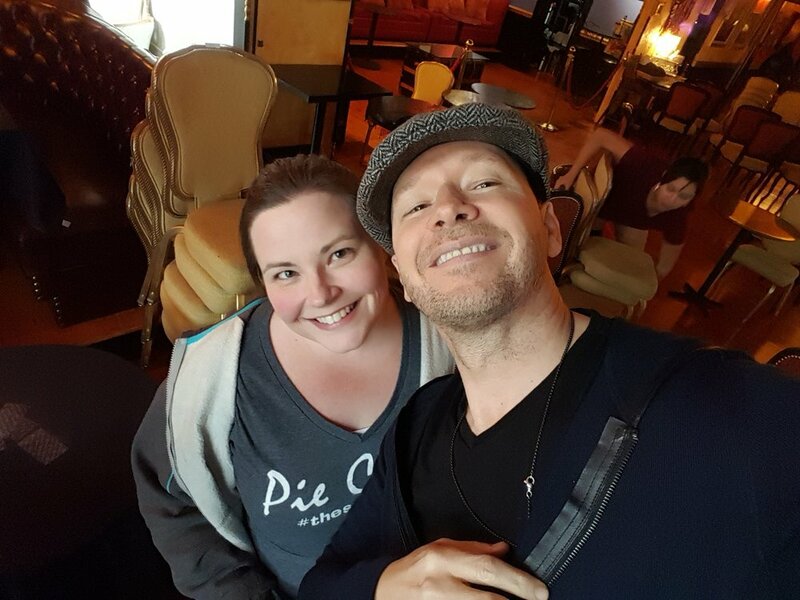 Donnie Wahlberg was amazingly nice. Like amazing. He was down to earth and normal and offered to take pictures with us. After we carried THE cake in (they had ordered some others for the party) he inquired if we had some sparklers to put on top. We actually did . . . at the shop. So we drove back to the shop to retrieve them. On the way we called Sugar Sister Nina ---who was on her hands and knees scrubbing the kitchen floor (no lie). We told her we met Donnie and you know what her response was? She hung up on us! She really did! She was angry that she was on her hands and knees scrubbing the floor when we called and dared to joke about her teen hearththrob. Sugar Sister Nina is probably Donnie's biggest fan---she's been to five NKOTB concerts. When we got back to the shop Sugar Sister Michelle ran up to the loft to get the sparklers while Sugar Sister Rissa went to show Nina the picture of Donnie so she would believe us. In the thirty seconds it took to run upstairs, unlock the door, retrieve the sparklers and run back down, Nina was already in the car putting on her makeup and had an extra Coconut Cake in hand. You see, Nina believes we have the best Coconut Cake in the nation and she wanted Donnie to have our Coconut Cake so. . .
Michelle (talking to Donnie as if they are old friends): Donnie, this is our sister Nina, she's been to so many of your NKOTB concerts. . .
Nina: and here I am covered in cocoa powder"
Donnie: Who doesn't like cocoa powder? Let's get a picture, where's your phone? Nina, of course, in her scurry to get in the vehicle before we left without her, forgot her phone. But Sugar Sister Michelle is always prepared to take a picture. . .
Sugar Sister Nina finally got to meet Donnie! The Sugar Sisters with Donnie----Nina brought him our famous Coconut Cake!